The long-awaited biography of the enigmatic Soviet leader whose “new thinking” sent shock waves throughout the Soviet Union and indeed the world. Taubman (Emeritus, Political Science/Amherst Coll. ), who won the National Book Critics Circle Award and Pulitzer Prize for Khrushchev: The Man and His Era (2003), is perfectly qualified to delve into the political psyche of Mikhail Gorbachev (b. 1931), who had everything to do with ending the Cold War and managed to emerge—rather miraculously unscathed—from the layers of Soviet intrigue. 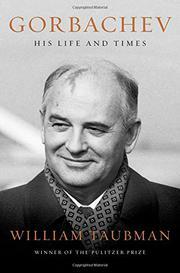 The author delivers a series of intriguing questions to drive his page-turning, chronological narrative—e.g., “how did he become Communist party boss despite the rigorous imaginable arrangement of checks and guarantees designed to guard against someone like him?” From his earliest years, Gorbachev, the son of peasants, developed a remarkable self-confidence derived from a tremendous intelligence and dedication to join the great mission of his country. His early education at Moscow State University, work on a collective farm, and formative first job as head of the Komsomol regional committee in Stavropol gave him a good sense of how “rotten” the inner workings of the Soviet system had grown. Moreover, his close relationship with his wife, philosopher Raisa Titarenko, provided him an intellectual partner with whom to exchange and develop his ideas of reform. Those ideas evolved through the de-Stalinization campaign of the Khrushchev years and the subsequent smashing of the Prague Spring of 1968. Indeed, Gorbachev referred to himself as a “man of the sixties” who gradually ascended the ranks under Leonid Brezhnev and was the only viable leader who remained to take the reins in 1985 after the power vacuum left by the deaths of the aged leaders Yuri Andropov and Konstantin Chernenko. He was young, groomed, well-read in texts once banned by the Soviets, and Westernized, and he had a glamorous, intellectual equal as a wife—all of which allowed him to take the world by storm. Taubman follows it all with gusto. An engaging, poignant portrayal of one of the most significant of Russian leaders.